Imagine you are in a big hall wearing your best dress, in front of a half round stage, and one announcement is being made. Slowly the curtain goes up, and lights go down. You see a scenario where at least 100 people are seated on beautifully arranged chairs or platforms – well dressed (in some ironed black and white suits), each holding a different type of musical instrument – and welcoming you with a soft but fresh piece of music! That is the feel of listening to an orchestra. Many people, especially those who are not related to any musical background, get confused between orchestra and symphony. If you are one of them, this article is for you. Here, we will talk about the orchestra, symphony, and the minor difference between them. Let’s start with the generic meaning of orchestra and symphony. As you can see, the orchestra is composed of many varieties of instruments. These instruments and the band as a whole evolved over the period to incorporate with up-to-date technologies and artistic developments. Symphony is a piece of instrumental music for an enormous set of musicians. It can be played in the context of an opera, as a soothing piece of orchestra or solo. So here, you can say that the symphony is a distinct style of music played by an orchestra. We, not being technically connected to the musical world, understand that there are three types of bands – an orchestra, a symphony orchestra, and a philharmonic orchestra – which do not differ much from one another. But, there are huge fundamental differences between symphony and orchestra. Orchestra is a broad term. Symphony can be covered under an orchestra, but an orchestra can’t be covered under symphony. The orchestra includes 50 or less than 50 musicians and plays some older tunes written/composed for some private halls or family functions, where symphony orchestra needs 100 or more people who just play harmonies. If an orchestra is small enough, it may not play a symphony. Musicians related to the orchestra only play ‘strings.’ But, if the orchestra is big enough, then it can play symphony as it requires 18 to 20 instruments and their players. Orchestras mainly played with string instruments, where the symphonies have to be created with all types of instruments – string, wind, brass, and percussion. We know about such variations only if there are two different groups in one area and both try to distinguish/prove their type. During our research regarding symphony vs. orchestra, we came to know about these interesting things mentioned above. We hope you found them relevant as well! You can use both the terms to define Western classical music. Both have their origin and traditional forms. But, these forms often molded or reformed by generation to generation. The roots of symphonies and orchestras are in the Greek music and dramas. There are two main tasks – writing and conducting. In the ancient time, both the activities were done by the composer himself. But nowadays, it rarely happens. 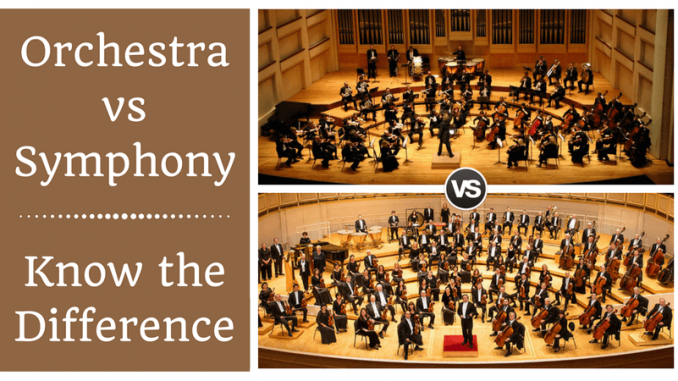 We hope this article helps you to clear your confusions regarding what is an orchestra and what is a symphony! From now onwards, when you face such questions, read this write-up to upgrade your knowledge.